Today is Independence Day in the United States Of America, the 238th birthday of USA. 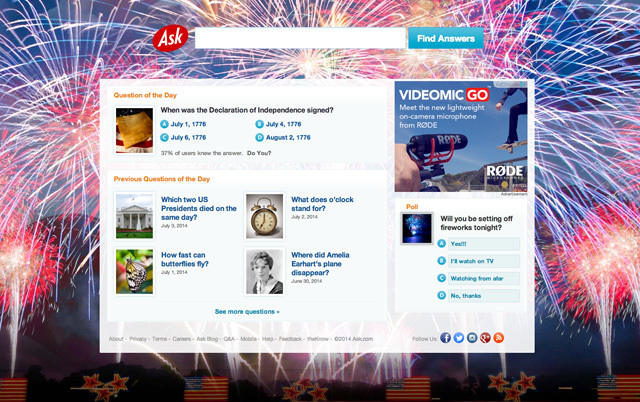 To celebrate, Google, Bing, Ask.com, Dogpile and others have special logos or themes on their home page. But surprisingly, Yahoo did not animated their logo - not yet - at least. Google's logo is a video but also an animated GIF. It first loads an animated GIF and when you click on it, it loads a video powered by YouTube. For the logos from the past, check out the past year logos for 2013, 2012, 2011, 2010, 2009, 2008, 2007, 2006, 2005 and 2004.